A few weeks ago, I posted an interesting Japanese style hot dog recipe from Vancouver. It was very well received by all my readers. So, I thought I should share this localized recipe on another American all-time favorite. This is the Malaysian Style Hamburger! As I have not seen hamburgers being decked this way anywhere else, I am convinced this recipe is uniquely Malaysian and Singaporean. There are slight variations on how it's packaged; but, the key "extra" ingredients like the fried egg, cucumber, chili sauce are always present. 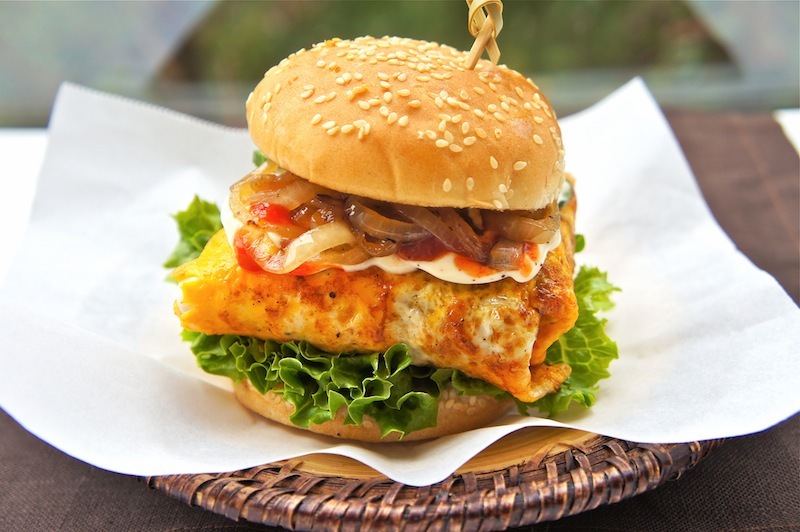 In this recipe, the grilled meat patty is placed on a thinly fried omelette and topped with cheese, sweet chili sauce, mayonnaise, and seasoned with pepper. 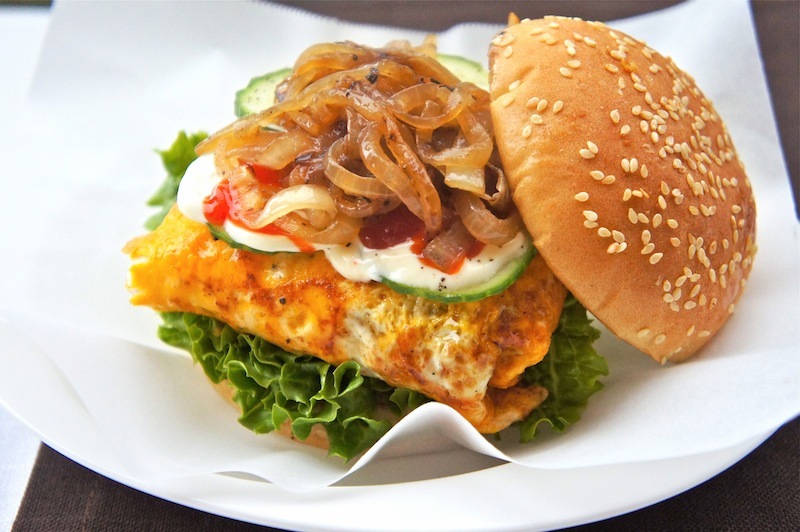 Simply wrap the patty with the egg when the cheese melts, and sandwich it on a toasted sesame bun with lettuce, cucumber slices, and some caramelized onions. This is a super good burger. I hope you will give it a try. Enjoy! Combine the ground beef and season with sea salt, black pepper, and Worcestershire sauce. Divide the meat into 6 equal patties. Shape the patties to about the size of the burger buns. Caramelized Onion: In a medium skillet over moderate to high heat, sauté the onion with peanut oil until the onion is caramelized. Then drizzle with Worcestershire sauce and season lightly with sea salt and pepper. Meanwhile, make the omelette. In a large mixing bowl, combine the eggs, sea salt and pepper, and lightly beat the eggs with a fork. Using a large non-stick pan, add about 1 12 tsp of oil over medium heat. Pour the egg mixtures onto the pan. Let the egg mixtures cook for about 2 minutes, or until the eggs are set. Turn, and cook the other side of the eggs. Prepare the grill or a large cast iron pan over high heat. Grill the patties to desired doneness, turning only once. Set aside the cooked patties. Place an omelette on the pan, follow by grilled meat patty and top with cheese, sweet chili sauce, mayonnaise, and seasoned with pepper. When the cheese has melted, wrap the patty with the egg, and sandwich it on a toasted sesame bun with lettuce, cucumber slices, and some caramelized onions. I love this spin on the classic burger. I'm gonna give it a try! hehehe I second Swee San - the moment I saw the title Malaysian Style Hamburger I was thinking about RAMLY :DDD Love the "double special" with two beef patties!! Totally agree with Swee San - a sophisticated version of Ramli burger and this post is certainly making me hungry. At first,i had wanted to ask you if this is the Ramli burger but I guess not...quite. Yours is more luxurious! OK I'm a dork I read the whole recipe now and I see this is actually a burger..it's dinner, but still, it will soon be breakfast at my house. I've never seen this type of burger before. The omelet around the patty sounds fantastic. I have to try this! That is one really large and tasty looking burger!